MEMOFIN - ESMA‘s technical advice on the evaluation of the Regulation 236-2012 of the European Parliament and of the Council on short selling and certain aspects of credit default swaps - L'information financière que vous ne trouvez nulle part ailleurs ! 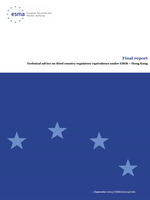 In each of the following sections, the ESMA advice to the Commission is presented preceded by the various findings, including an overview of the results of the quantitative analysis conducted by ESMA and the feed-back from the public Call for Evidence and from the survey among competent authorities. In terms of the general impact of the Regulation described in Section II, ESMA observed mixed effects on liquidity and a slight decrease in price discovery. However, ESMA acknowledges that the findings of the Technical Advice should be interpreted with caution considering, first, the difficulty in identifying the specific effects of the Regulation and, second, the limited time period for the assessment resulting from the tight schedule imposed by the Regulation itself. Therefore, ESMA invites the European Commission to revisit the assessment of the Regulation at a later stage. Section III specifically deals with the transparency and reporting requirements. From the analysis of net short positions in shares reported to competent authorities and disclosed to the public, it can be concluded that overall investors are relatively averse to crossing the publication threshold of 0.5%. ESMA considers that the current reporting and disclosure thresholds are appropriate and only suggests considering some technical improvements; a) in the method for calculating net short positions, notably to facilitate the access by investors to information on indices and on issued share capital, and b) in the information provided to the competent authorities and to the public through the notifications in the case of actively managed funds and on positions held through convertible bonds or subscription rights. However, with respect to net short positions in sovereign debt, noting the very low number of notifications received, ESMA recommends to revisit the method of calculation, particularly the duration-adjusted approach, and to review the thresholds for notifications. Section IV covers the restrictions on uncovered short sales in shares and sovereign debt. The introduction of these restrictions has had, as intended, a noticeable impact on the incidence of settlement failure, though this improvement in settlement discipline may have affected the securities lending market. Thus, ESMA recommends considering some adjustments to the regime, notably to allow internal locate arrangements within the same legal entity provided that appropriate separations between internal trading and lending desks are put in place. ESMA also suggests revisiting the issue of the definition of ―liquid shares for the purpose of locate arrangements at a later stage, when proper regulatory data on securities lending would be available. Section V considers the related issue of requirements on buy-in procedures and penalties for settlement discipline purposes. The Regulation allowed for a first EU-wide experience in the matter, though with some limitations. ESMA supports the views, already stated in the Regulation itself, that a wider and more harmonised regime should be addressed through horizontal European legislation, namely the forthcoming CSD Regulation, to cater for the particular cases of illiquid shares and SME shares while ensuring a level playing field in terms of application. Section VI presents the assessment of the impact of the ban on uncovered sovereign CDS transactions. Overall, this restriction seems to have no compelling impact at this stage on the liquidity of EU single name CDS as well as on the related sovereign bonds markets, even though a decline in activity for sovereign CDS in a few EU countries and reduced liquidity in European sovereign CDS indices could be noticed. Acknowledging that this area should be kept under review in light of gained experience, ESMA nevertheless suggests that higher legal certainty could be pursued by clarifying some wording in the legal text (e.g. on the correlation test) and that some refinements to the detailed provisions could be envisaged: use of sovereign CDS indices for hedging purposes, cross-border hedging under certain liquidity and correlation circumstances and group hedging by a particular and dedicated entity. Section VII describes the practical problems, complications and cost-related issues encountered with the approach for determining the list of shares that are exempted from the Regulation on the basis of turnover calculations. It also includes a suggestion for an alternative approach to draw up such a which is essentially based on two criteria: the domicile of the issuer and whether admission to the European venue has been requested by that issuer. Section VIII deals with the exemption for market making activities. Despite the recently published ESMA guidelines, ESMA considers that further clarifications are needed and that changes to the Level 1 text may be worth considering. Areas for potential changes would relate to the scope of the exemption and the conditions for being able to make use of the exemptions. The trading venue membership requirement might be reviewed so as to allow also market making activities on purely OTC traded instruments to benefit from the exemption and the scope of financial instruments eligible for the exemption could be expanded. With respect to the notification procedure, ESMA suggests to consider a change in the instrument per instrument approach for the purpose of notifications and not to apply the 30 day period for objecting to use of the exemption to newly admitted instruments. Finally, Section IX deals with intervention powers and emergency measures. Mixed market impacts have been noticed in relation to the longer term emergency measures in case of adverse events or developments constituting a threat to financial stability or market confidence that were introduced by a couple of EU countries and have since been fully or partially lifted. Nonetheless, ESMA considers that the provisions allowing to impose such measures are necessary and appropriate. On the basis of the few concrete experiences of short term bans imposed in case of a significant fall in price of a financial instrument, no clear conclusion could be drawn as to their effectiveness. However, ESMA considers that the approach for introducing such temporary bans should be reconsidered with the view to simplify and ensure more consistency in their application.